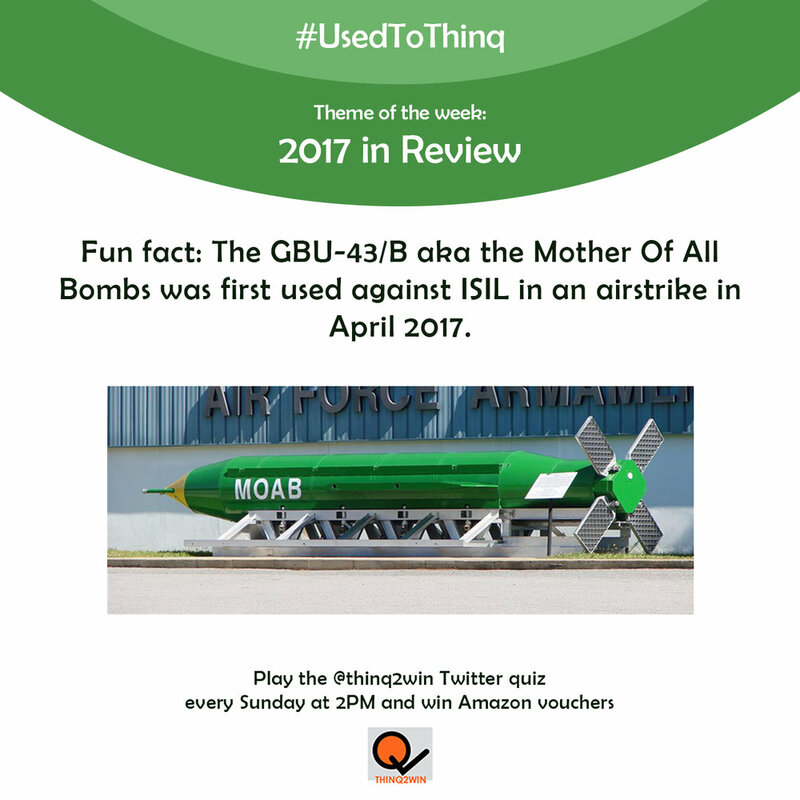 #UsedToThinq is our weekly Twitter quiz is where trivia nuts hang out each Sunday afternoon. To play, join us @thinq2win on Sundays at 2 pm IST. 10 trivia questions on a theme and multiple winners with Amazon and other vouchers at stake. Now, get used to THINQing. 67. 2017 in Review (31 December 2017) Play it here! 66. Christmas Special (24 December 2017) Play it here! 65. Nobel Prizes (17 December 2017) Play it here! 64. Names of Trains (10 December 2017) Play it here! 63. First and Last Lines in Books (3 December 2017) Play it here! 62. The Fab 4: Tendulkar-Dravid-Ganguly-Laxman (26 November 2017) Play it here! 61. Sherlock Holmes (12 November 2017) Play it here! 60. Eponymous Names (5 November 2017) Play it here! 59. Batman (29 October 2017) Play it here! 58. Indian Business Houses (22 October 2017) Play it here! 57. Amitabh Bachchan: The Shehenshah of Bollywood (15 October 2017) Play it here! 56. Capital Cities (8 October 2017) Play it here! 55. M. K. Gandhi in Movies, Plays and Music (1 October 2017) Play it here! 54. Villains (24 September 2017) Play it here! 53. Famous Russians (17 September 2017) Play it here! - Special Edition #1: पूर्वीचे पुणे राहिले नाही! (14 September 2017, 9:30 PM) - Play it here! 52. Fun With Flags (10 September 2017) Play it here! 51. Things You Find In Cars (3 September 2017) Play it here! 50. Indian Words in the English Language (27 Aug 2017) Play it here! 49. Champions League Football (20 Aug 2017) Play it here! 48. Water Bodies of the World (13 Aug 2017) Play it here! 47. British Bands (6 Aug 2017) Play it here! 46. The North-East (30 Jul 2017) Play it here! 45. Things that start with Q or end with Z (23 Jul 2017) Play it here! 44. Deaths in Game of Thrones (16 Jul 2017) Play it here! 43. The Ramayana (9 Jul 2017) Play it here! 42. Dictators of the World (2 July 2017) Play it here! 41. Movies about Space (25 Jun 2017) Play it here! 40. The Adventures of Tintin (18 Jun 2017) Play it here! 39. Fonts and Typefaces (11 Jun 2017) Play it here! 38. Phobias (4 Jun 2017) Play it here! 37. Four-Letter Words (28 May 2017) Play it here! 36. Celebrity appearances in FRIENDS (21 May 2017) Play it here! 35. Car logos (14 May 2017) Play it here! 34. Songs of A.R. Rahman (7 May 2017) Play it here! 33. Mangoes & other summer fruits (30 Apr 2017) Play it here! 32. Words and phrases invented by Shakespeare (23 Apr 2017) Play it here! 31. Doping scandals in sports (16 Apr 2017) Play it here! 30. India's Neighbours (9 Apr 2017) Play it here! 29. Lesser known Harry Potter characters (2 Apr 2017) Play it here! 28. TV ads from the 90s (26 Mar 2017) Play it here! 27. Underwear (19 Mar 2017) Play it here! 26. Coke, Pepsi, and the World of Soft Drinks (12 Mar 2017) Play it here! 25. FLOTUS (5 Mar 2017) Play it here! 24. Cartoon Network cartoons (26 Feb 2017) Play it here! 23. Women in sports (19 Feb 2017) Play it here! 22. Internet Slang (12 Feb 2017) Play it here! 21. Music in films (5 Feb 2017) Play it here! 20. Ridiculous Hairstyles (29 Jan 2017) Play it here! 19. Most painful deaths (22 Jan 2017) Play it here! 18. Animals of Bollywood (15 Jan 2017) Play it here! 17. Automobiles (8 Jan 2017) Play it here! 16. Ancient Civilizations (1 Jan 2017) Play it here! 15. The Christmas quiz! (25 Dec 2016) Play it here! 14. Films of Chris Nolan (18 Dec 2016) Play it here! 13. Indian Scientists (11 Dec 2016) Play it here! 12. The Big 4 of Tennis (Federer, Nadal, Djokovic, Murray) (4 Dec 2016) Play it here! 11. Mahabharata (27 Nov 2016) Play it here! 10. Things you will find in a Bathroom (20 Nov 2016) Play it here! 9. Nicknames of Football Teams (13 Nov 2016) Play it here! 8. Tattoos (6 Nov 2016) Play it here! 7. The Diwali Quiz (30 Oct 2016) Play it here! 6. Superheroes (23 Oct 2016) Play it here! 5. Indian Military Operations (16 Oct 2016) Play it here! 4. Cricket Controversies (8 Oct 2016) Play it here! 3. Indian Food (2 Oct 2016) Play it here! 2. Worst of Bollywood (20 Sep 2016) Play it here! 1. 2016 TV shows (15 Sep 2016) Play it here!